Budget phone specialist Alcatel has announced its first Android smartphone, with the Alcatel OT-980 bringing Android 2.1 and a 2.8 inch touchscreen display. 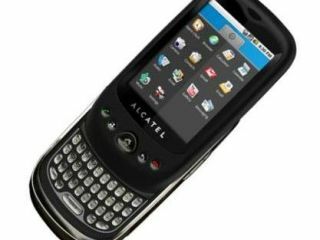 The Alcatel OT-980 represents two firsts for the company as it moves into the world of smartphones and the Android OS. The 'dual function' phone has both touchscreen and QWERTY keypad, Wi-Fi, HSPA, E-Compass, Multi IM client an MP3 player and a 2MP camera, and will, unsurprisingly, become the manufacturer's flagship phone. "Continuing the quest to make their communication devices accessible to the mass market, the Alcatel OT-980 is the bold new choice among Android 3G/3G+ smartphones," explains Alcatel's release. "Ultra-stylish and dynamic, the Alcatel OT-980 is set to bring the hugely popular Android 2.1 Éclair operating system to a wider range of consumers. "Combining advanced technologies with a sleek design the OT-980 handset enables the user to personalise their mobile phone by adding new options and features to the device by downloading applications. "From social networking apps such as Twitter, Bebo and Facebook, to shopping, games and music apps, the app world becomes accessible to all." The OT-980 phone will be available from Carphone Warehouse for £99.95 on Pay As You Go contract, with a UK release date of October 2010.